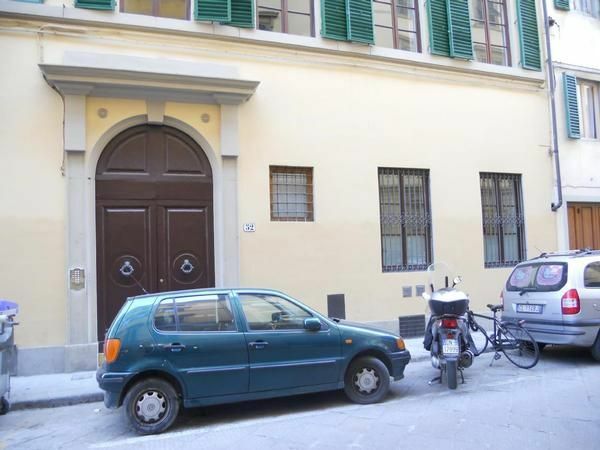 Is a picturesque and confortable apartament which is situated in the heart of the city: 100 metres close to Santa Croce Square and 10 minutes far from the Cathedral, Uffizi,Signoria square and Ponte Vecchio. It is on the ground floor of an old florentine fourtheenth – century building which was restored in the 2007 and it has got a separated entrance. The apartment is 73 mq with tiling floor and reftered ceiling and it provides accomodation for five people. It consists of: an hall, a cooking area, a spacious livingroom with a double sofa bed, a double room (there’re two beds which you can joint or separate as you wish), an intermediate floor with a single bed, bathroom with shower and bidet. This apartment is well furnished and it is very confortable: there is a tv, air conditioning, indipendent central heating, electronic stronbox, oven, dishwashing machine, towels, table linen and bed linen,Internet wireless. Since it is very conveniently situated, you can easily visit the centre of the city without taking public transports, even if this area is well served by public transports. In the neighbourhood you can found pizzerias, pubs, internet points, cafés, international restaurant... and in an old square next to the apartment called Ghiberti square takes place from Monday to Friday the local market. There you can buy every kind of goods: foodstuffs, clothes, souvenirs, antiques and flowers. Parking facilities: per object and day according to consumption (Mandatory). Visitor's tax: per person and day Costs amounting to 3 EUR (Mandatory).